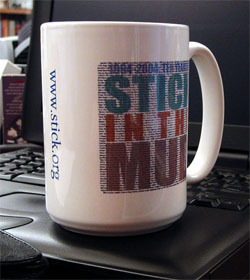 Stick in the MUD celebrated its tenth anniversary on February 21st, 2004. To celebrate the anniversary year, Paruda has designed two commemorative items that the good folks at CafePress, with all their high-tech imaging wizardry and a little financial incentive, can churn out on demand and send to you the distinguishing mudder. The two items are the beautiful 15 oz (430 mL) Stick in the MUD Anniversary Mug and the huggable Stick in the MUD plush bear. We tried to get them to produce Stick in the MUD notebook computers and Stick in the MUD VW Beetles... but it turns out that the buttons to click to make those happen were all in Paruda's mind. So mugs and bears it shall be. Terribly sorry about that. The mug has two designs. 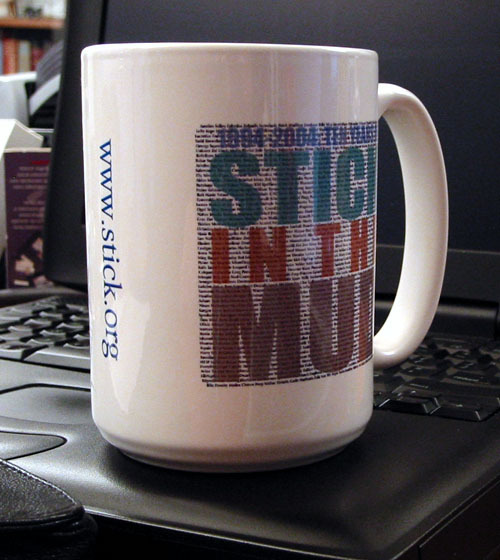 On one side is an updated rendering of the Stick in the MUD logo, noting the 10th anniversary. Woohoo! On the other is a potentially eye-damaging block of teeny tiny itty bitty just-barely-legible text containing the names of 1147 of the most successful (or at least highly addicted) players ever to grace the scrolling text of Stick in the MUD. From today's immortals to players who wore out their welcome before the mud's first birthday and were strung up by their sub-issue leggings... they're here. Overlaying this big pile of names, in big colourful letters, are the words 1994-2004: TEN YEARS OF STICK IN THE MUD. See if your name is on the mug. 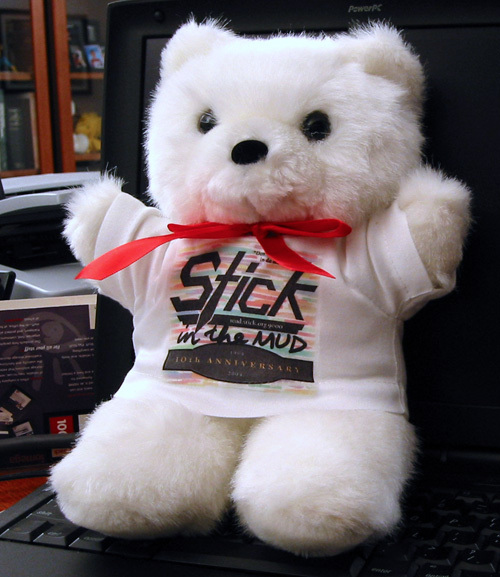 The bear is a cute little critter in a white t-shirt with the updated logo. So, now that you're positively giddy at the prospect of forking over some of your hard-earned dough for one of these precious artifacts, we're getting close to the link of interest. As always, read the fine print. The satisfaction guarantee and return/exchange policies on the CafePress site are recommended reading. If, like a lot of SitM players, you live outside the United States, pop by this link for a few words about buying internationally from CafePress. Prices, while not exactly cheap (you probably wouldn't want any of this stuff unless Stick in the MUD has more significance to you than generally drinking out of mugs and/or hugging a bear), the prices are set at the CafePress base prices (visit CafePress if you're interested in their pricing model). We haven't built in any profit margin on the mugs and bears as we want to make it as easy as possible for you to get your hands on these things.